Style and sync king 2017! well that was a ride. fun and filled with action! sweet music, flawless synch, brilliant idea. Flawless direction and tons of style, but with so much happening it could've been more impactful if it were like half a minute shorter. Looking forward to Revision anyway! Absolutely perfect for an invitation. Seriously considering attending the party now. Oh, it was an issue on Firefox only, Chrome worked. Great invi! Nice execution of the idea and a lot really great timing how the different scenes are presented, and the runtime is perfect. Also a worthy contender for the Biggest Team Involved In An Invitation DUB Award! Great flow, very competently done in all respects, very inviting. As a demo, not very interesting in my opinion but great work nevertheless. Continues the thing I loved most from "What are you syncing about". Really well done. Woah! awesome show! Keep the wacky madness coming! Bloody hell that was FRESH! Stylish and uplifting; works very well as an invitation. By far the best Revision invite I have seen so far. Awesome style, great sync. Perfect timing. You are the real wizards. Wonderful pace, excellent music and amazingly precise execution of a cool concept. Great work, everyone involved! You got some SERIOUS style here! But yeah, the music is a bit repetitive. Still, kickass demo! Awesome! Another demo that Blueberry will watch over and over and over again. Dope chord progz, Sigveseb! This is so good. Fun, colorful and cheerful. anyone hating on this demo has obviously given up on life, i mean come on! Really well done and never gets boring. Tightly music-synced visuals is always cool! Fresh look as well. Did get some weird bugs with some of the texts though, letters got stacked over each other. Wow, impressive from a HTML file. Can we have a big banner that just says: 'NO PARTY' outside, and then sceners turn up and tap noses at each other. So so great! and the design! and those syncs! Fresh! Great design in code and music. lots of well crafted transitions but the style gets tedious quickly. thumb for the effort and extra thumb for keeping it within 6 mb, doesn´t make me want watching it again though. 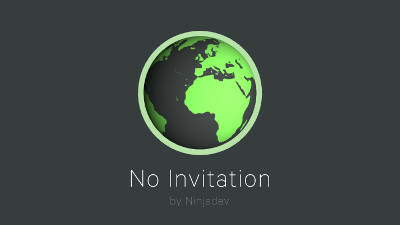 well done, a nice new iteration of your proven style, and it works well as an invitation. That said, I wouldn't mind to see Ninjadev try some different stuff ;). rulez added on the 2018-01-02 00:05:05 by JAC! Aaaaand HERE we go with my new ringtone! This production is so wow, much awesome! i have already thumbed it up, just came by to say again how absolutely fantastic this demo is. should be a trendsetter. Da c00lness pow 10, lovely sync'n'stuff! Will definitely want to attend the (no) party this year! Fantastic from start to finish. No rulez, just revision! incredibly stylish, can't wait for the party! Insane direction. Like What Are You Syncing About but without any lapse in any point. Great work! You're the best!! Very nice but jerky frame-rate in HD on i7-8700. A great invitation with a very good flow. The music and the effects match perfect. This is, how a demo should look like in 2017 / 2018 ! Nice ideas, graphics and music on a modern high level. Perfected the concept and the execution. Works amazingly as a jingle, too. Love that 5-chord motif, love that sync. Best invitation ever!! Style, sync, polish, this has it all!! Can the 2019 invitation top this? I sure hope so! page created in 0.024811 seconds with 16 queries.